Melt butter and chocolate in a medium sized saucepan over low heat, stirring frequently. mixture for each. Combine cocoa and cinamon. 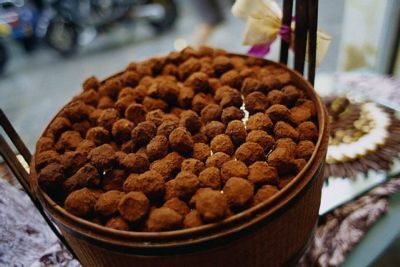 Roll balls in cocoa mixture. Place each in a small paper cup Store in tightly covered metal container in refregerator. Remove from refregerator and let stand at room trmperature about 30 minutes before serving.